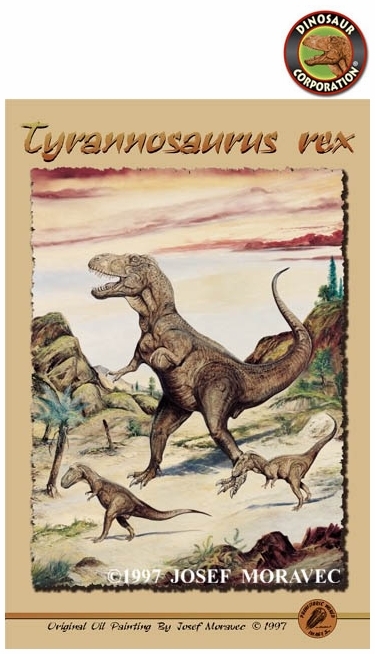 Home | GIFTS | Crystals | Tyrannosaurus rex with babies Poster 36" x 24"
Tyrannosaurus rex with babies Poster 36" x 24"
Tyrannosaurus rex poster will definitely add a vibrant Jurassic mood to any bedroom, office or playroom. This superior quality dinosaur T-rex poster will delight and educate all at the same time. T. rex was a huge meat-eating dinosaur that lived during the late Cretaceous period, about 85 million to 65 million years ago. T. rex lived in a humid, semi-tropical environment, in open forests with nearby rivers and in coastal forested swamps. Tyrannosaurus rex was up to 40 feet (12.4 m) long, about 15 to 20 feet (4.6 to 6 m) tall. The arms were only about 3 feet (1 m) long. Tyrannosaurus rex was roughly 5 to 7 tons in weight. The enormous skull was about 5 feet (1.5 m) long. The eye sockets in the skull are 4 inches (10.2 cm) across; the eyeballs would have been about 3 inches (7.6 cm) in diameter. T- rex left footprints 1.55 feet (46 cm) long (although its feet were much longer, about 3.3 feet (1 m) long; T- rex, like other dinosaurs, walked on its toes). It had a stride length of up to 12 to 15 feet (3.7-4.6 m). T- rex may have run at up to 15 mph (24 kph).